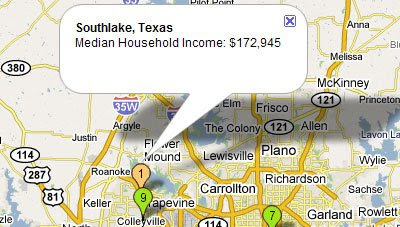 According to the U.S. Census' American Community Survey, released on Dec 9th, the most affluent neighborhood in the United States is Southlake, Texas. The estimated median household income is $172,945. According to Forbes the neighborhood owes its wealth mostly to its real estate growth. This Google Map mash-up shows the 20 most affluent neighborhoods in the US based on the census data. It was created using the Google Maps Spreadsheet Wizard and Pamela Fox's Geocoding with Google Spreadsheets Gadget. All I see is a blank map. What happened to Atherton CA with a median household income of over $200,000? I figured out what happened - my work firewall blocked the data! Strange. Ok, Loving County Texas - time to get on the map. With a population of 67, I guess thats about 15 households. Assuming no one there works bring in 15 more people earning $172,946 (hey, thats pretty easy - run a Google mashup business from Loving, TX). Next year you are on the map and real estate prices are up there (or down there!) with Southlake. Sell. Confess. Write a book.